Gun violence is unfortunately never far from our consciousness. Gun deaths occur daily, and mass shootings like the recent killing of nine people in a church in Charleston seem to be happening with greater frequency in this country. I'm not one to get political on this theater blog, but it's clear that we have a problem, and it cannot be solved until both "sides" let go of their firmly held beliefs and meet in the middle to come up with a solution to stem the epidemic. 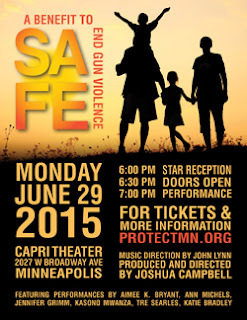 A group of local music-theater artists, led by Joshua Campbell, held the third annual benefit in support of Protect Minnesota, an organization working to end gun violence right here in our home state. The goal of the evening was to raise money for the organization, but also to start a conversation, because that's truly the way that change will happen. And of course, to enjoy some fabulous performances. Mission accomplished on all fronts! Similar to the benefit I attended two years ago (I missed last year), the evening was structured as performances of songs from musical theater and pop culture, interspersed with relevant readings. The text this year came from a play called The Gun Show by EM Lewis. 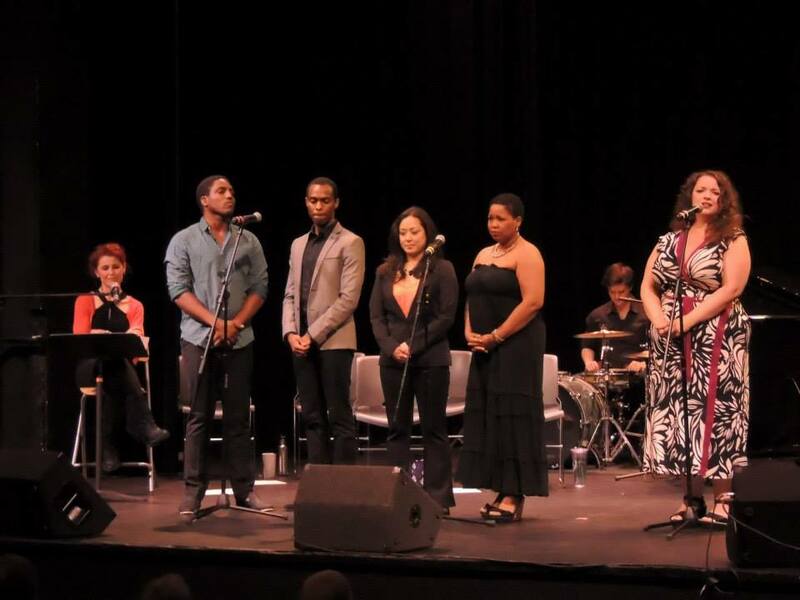 The excerpts (read passionately and emotionally by Ann Michels, who didn't sing much because she's saving it for her other job) made me want to see the entire play. EM Lewis is one of those people who is in the middle - she grew up with guns in rural Oregon and still owns a gun, but recognizes that there needs to be some changes in the way we think about, legislate, and handle guns. The play is funny, honest, and thought-provoking. Aimee once again channeling Celie from The Color Purple with the song that's guaranteed to bring tears to my eyes, "I'm Here"
The fantastic group numbers - the Beatles' "With A Little Help From My Friends" and John Legend's "Humanity (Love the Way It Should Be)"
In addition to the performances, there was also a raffle of theater tickets, a speech by a local pastor, and a remembrance of the nine victims of the recent Charleston shooting. A great show for a great cause, what's better than that? To find out more about Protect Minnesota, visit their website. And start a conversation, perhaps with someone you don't agree with, in an attempt to help find a shared solution.